Ditch those plastic water bottles and grocery bags! Both have a devastating effect on the earth, so do the environment a favor and start reusing! No more plastic water bottles (something I'm guilty of). 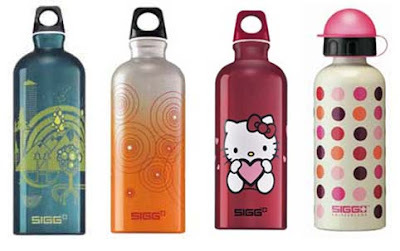 Purchase one of these very stylish SIGG Reusable Water Bottles. They are very durable and keep your liquids fresh and tasty. Click here to see all available bottles. Paper or plastic? How about neither! Help the environment by purchasing these lovely Envirosaks. 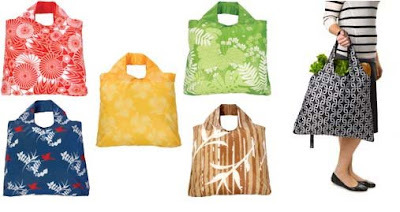 Lightweight, waterproof and durable (hold the weight of 2 plastic grocery bags). They come in assorted packs of five neatly rolled up in a carrying pouch. Click here to see other colors and patterns. yay! great greens! i love the sigg water bottles. i have one to take to the gym & i got 2 big ones for p to take to school. so much better for you than drinking out of those pesky plastic bottles & so much better for the earth.